Marah gilensis, or Gila manroot, Santa Catalina mountains, north of Tucson. This remarkable supporting appendage has two useful features. 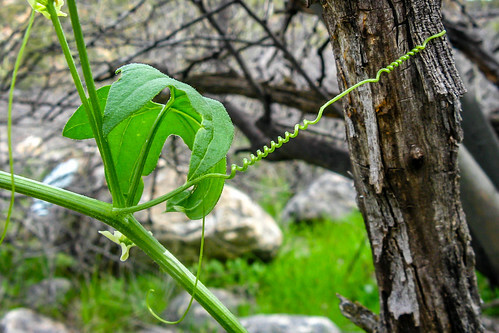 It can act as a spring to cushion the movement of the plant or its support (mesquite in this case), and it can lengthen or shorten, just like a turnbuckle in a screen door or a gate, by rotating the center portion about its axis. Note that the two helical portions have opposite pitch--the left and right ones are left-handed and right-handed, respectively.